I tried out RubyOnRails a year ago and working with MVC is great! asp.net MVC did a great job! Everything is just where it should be and i love Telerik's efforts to fully support MVC! 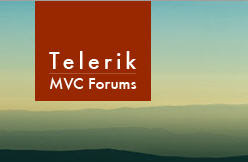 @Serrynaimo- Glad you like what you're seeing with MVC and Telerik's support for MVC! Give the controls and the demo a try and let us know how you like our early support.